This molecular structure shows glycolaldehyde, which is the most basic sugar and can react to form ribose, the central component of RNA (similar to DNA). A sugarmolecule that's linked to the origin of life has been detected in a region ofour galaxy where habitable planets could exist. The sweet find is good news inthe search for alien life, the researchers say. Called glycolaldehyde,the sugar molecule is considered a life ingredient because it can react with asubstance called propenal to form ribose, a central constituent of ribonucleicacid (RNA), which is similar to DNA and considered one of the central moleculesin the originof life. They lookedfor the emission of certain wavelengths within the radio part of theelectromagnetic spectrum. Molecules each emit a distinctive band of radiowavelengths, which can be used as a fingerprint for the molecules.? 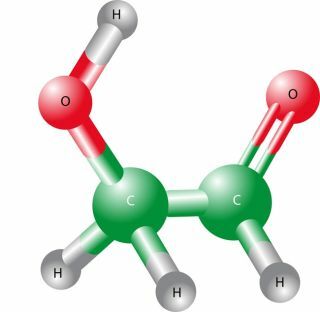 "Thisis an important discovery as it is the first time glycolaldehyde, a basicsugar, has been detected towards a star-forming region where planets that couldpotentially harbor life may exist," said researcher Serena Viti of theUniversity College London. Previously,the organic sugarhad been detected toward the center of our galaxy, where conditions areextreme and not conducive to planet-forming compared with the rest of thegalaxy. The newdiscovery, which will be detailed in a forthcoming issue of AstrophysicalJournal Letters, was in an area distant from the galactic center. Inaddition, the sugar was found in a swirl of gas and dust around a collection ofstars. "Possibly, this material is actually rotating around the stars,which may imply that it's a disk and that's where planets may form," Viti toldSPACE.com. She added, "Alsothe fact that it's just a normal star-forming region suggests that theproduction of this molecule could be common throughout the galaxy." Thedetection of one life ingredient also improves the chances that the moleculeexists alongside other molecules essential to life and in regions whereEarth-like planets may exist, she said. "Thefact that a basic sugar so directly linked to RNA is common makes you think thebasic ingredients for life are out there," Viti said. "They're notjust on Earth."